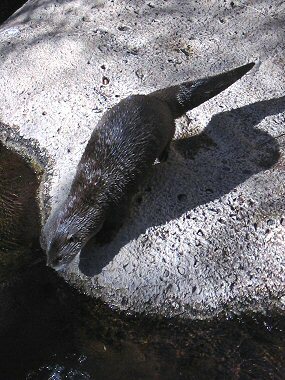 River Otters are semi-aquatic, slender, long-bodied mammals that grow to 35-51 inches in length and weigh 11-30 pounds. They are specialized for aquatic life with thick guard hair, dense oil under the fur, webbed toes, and small ears. Coloration is a dark brown above (looks black when wet), with a paler belly and silvery gray throat. They have short legs and thick tails which they use to propel themselves through the water. 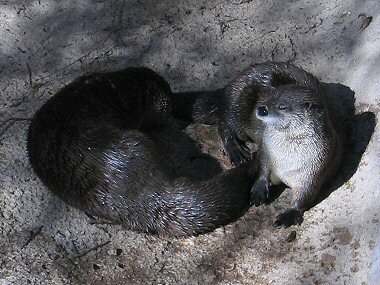 River Otters could once be found in many major Arizona Rivers such as the Salt, Verde, and Gila Rivers. Diversion of these rivers by people for farming, livestock, industry, and cities caused significant changes in the otters habitat. By the 1960's there were no longer any native river otters left in Arizona. Between 1981 and 1983, The Arizona Game and Fish Department released 46 transplanted Louisiana otters into the Verde River area. This population has successfully established itself, and it is estimated that about 100 otters now live in that area. River otters can hold their breath for up to eight minutes. Otters live in dens located in shelters dug by other mammals or in natural hollows under logs, trees, rock piles, thickets, or on river banks. Each den has an underwater entrance with a tunnel leading to a nesting chamber. They have both permanent and temporary nests. Nests are made up of leaves, grasses, mosses, pieces of bark, and some hair. Fish make up the greatest proportion of the otters diet with amphibians, arthropods, crayfish, and frogs also being consumed. They occasionally prey upon small mammals or feed on aquatic plants. Young reach sexual maturity after 2 or 3 years and can live up to 21 years in captivity.